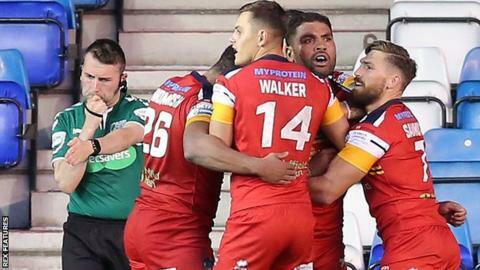 Jarrod Sammut's drop goal earned second-tier London Broncos a Qualifiers victory against struggling Widnes, who have now lost 17 games in a row. Sammut, who missed two from four goal kicks, nailed the one-pointer with the score at 20-20 in the final minute. The Super League hosts led 6-0 at half-time and then extended their lead to 14-4 after London hit back. Three scores without reply put the Broncos in front, before Krisnan Inu's try for the Vikings set up the finale. However, the mercurial Sammut was on target for London with his drop goal after Joe Mellor had earlier missed to secure victory. There was further disappointment for Widnes late on as new signing Charlie Gubb seemed to pick up a knee injury and had to crawl off the field.